The Ministry of Foreign Affairs in Bangkok has informed the foreign Embassies and Consulates in Thailand and the Royal Thai Embassies and Consulates worldwide about the visa run crackdown, the former in a letter dated June 23, 2014, of which thaivisa.com obtained a copy of today. For the first time in writing, the ministry confirms the Thai Immigration Bureau’s current crackdown on border runners. The Ministry of Foreign Affairs says the crackdown is aimed to prevent visa runners who abuse the visa exemption scheme from working illegally in Thailand. In the letter The Foreign Ministry is confirming earlier information that visa runners will be prohibited from entering Thailand as of August 12, 2014. Long stay visa applicants are advised to acquire appropriate (Non-Immigrant) visas at Thai Embassies or Consulates prior to their arrival. Previously the Immigration Bureau has announced a crackdown for border runners. 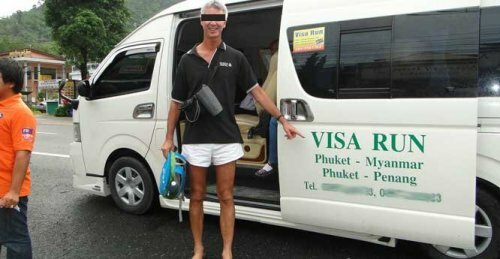 The published letter may also be a strong indication that the Royal Thai Embassies and Consulates now also might have been instructed to be restrictive in issuing multiple back-to-back tourist visas. Thaivisa com will seek further clarification from the Ministry of Foreign Affairs and from The Royal Thai Immigration Bureau, which we hope to obtain and subsequently publish shortly.